Pulling grass from my wild flower patch, when I saw a tiny blue butterfly flirting with the flowers. I ran to the house to fetch my camera, knowing the chances were slim to none the butterfly would be there when I returned. With camera in hand, I intensely searched the flower bed. Luck day, I was able to get this shot of not only one of the smallest butterflies in the USA but also, more importantly, an ENDANGERED SPECIES.. The Karner Blue Butterfly. 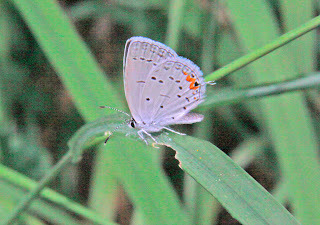 A native butterfly to the dry dune environments of the Great Lakes region, the Karner Blue became a threatened species because of habitat loss, due to urban and industrial development in the region which resulted in the range reduction of the only plant the Karner Blue uses for food as a caterpillar, the Wild Blue Lupine. In 1992 the Karner Blue was added to the Endangered Species list.